The New Links event of 2018, held in partnership with Youth on Course, took place amid the best summer weather Scotland has enjoyed in over 25 years, with clear blue skies and warm temperatures an almost daily norm. The unusual conditions allowed the North Sea to stand in for the Pacific Ocean as Brayden and his colleagues enjoyed their first shot at surfing. “None of us had surfed before. Once I got out there, I actually successfully got up on my feet, once for 23 seconds. It was a really cool experience”. However, in common with the rest of the group, it was golf that provided most of the week’s highlights. Colorado School of Mines freshman Brayden particularly remembered a putt on the eighth green of the Old Course. “I missed it pretty far right with a seven iron. It was a right-to-left…a bender. I went up to it, hit it, saw it tracking and tracking, and then it dropped. I thought: Let’s go! I measured it to 70 feet. It was the longest putt I’ve ever hit”. All told, the group played the Old Course, the New Course, the Jubilee Course, the Eden Course and the Balgove Course at St Andrews Links; The Duke’s Course; the Torrance Course at Fairmont St Andrews; and the hickory-only Kingarrock Course at Hill of Tarvit. They also toured the Royal and Ancient Golf Club and the British Golf Museum, and there was a very special Q and A with Frank Thomas and Valerie Melvin. Most evenings were spent in the company of local counterparts who showed them around the town. Harrod Tang, 18, and about to start at UC Davis, said: “It has changed the way I see golf. Before this, I was playing golf because I liked it and it was fun. After Kingarrock and meeting Frank and Valerie I have more respect for it and I cherish it more”. Harrod also commented on the overall experience of being in St Andrews. “It really starts with the people, though. You feel at home. A city is so fast you get disconnected. Here, you slow down and just focus on the moment”. Elizabeth Scholtes agreed. “St Andrews isn’t necessarily a place, it’s the people. We fit right in. The people were very accepting and willing to help us. It was an experience of community”. Elizabeth, 18, a plus one player who has signed up to Cal Poly San Luis Obispo, loved her introduction to links golf. “I don’t feel I have another shot in the bag now! Links golf is a completely different game; it is so fun… and everybody here plays really, really fast. For me, a five-hour round is normal. Here I just went up to the ball and hit it. I can definitely use that later. I know I over-think things”. Hayley Jang, 18, is about to enrol at Berklee College of Music, and she took the chance to play a Feurich piano at the University of St Andrews’ Music Centre. She chose to play pieces by Bach and Brahms and to improvise two passages on songs by Adele and Andra Day. On Bach’s Toccata in E minor, BMV 914, Hayley said: “It is one of my favourite Bach pieces, it’s very different…it is so unique but it has all of the characteristics he’s known for”. The other selection was Brahms’ Rhapsody in G minor, Op.79 No.2. “It reminds me of a storm…there are lots of repetitions and triplets”. Youth on Course chaperone Michael Lowe summed up the week. “We just enjoy and appreciate this opportunity. Our core purpose is creating life opportunities through golf. There is no better life experience than travel. For these students, to experience the Home of Golf, and live it, is a unique experience. In particular, the relationships formed with everyone here; friendships that will last a lifetime”. 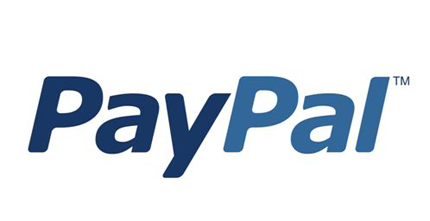 New Links is a St Andrews-based charity dedicated to helping young people achieve their potential through education, international travel and the game of golf. Around 160 young people from Scotland, Kenya, South Africa and the USA have participated in New Links activities since it was founded in 2006 and the organisation has also funded a four-year scholarship at the University of St Andrews. 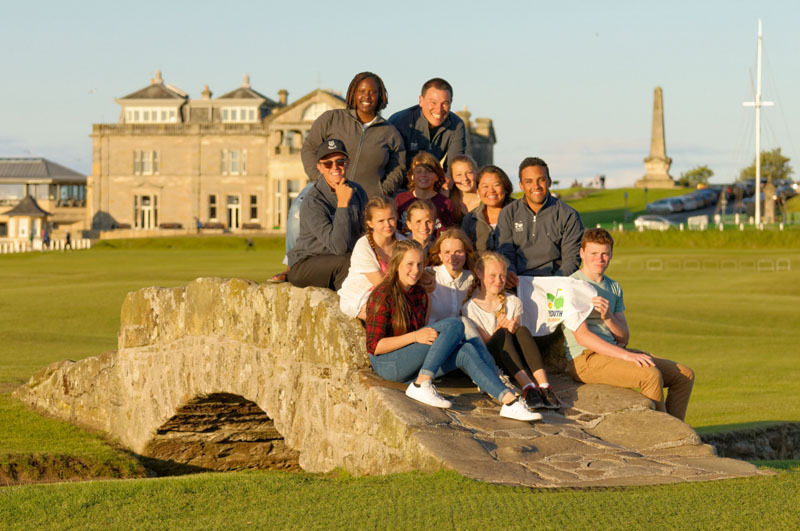 For a group of American teens from Northern California and their St Andrews counterparts the summer holidays climaxed with an unforgettable mix of sporting, educational and cultural activities at the Home of Golf. New Links, a St Andrews-based charity dedicated to helping young people achieve their potential through education, international travel and the game of golf, in partnership with Youth on Course, organised a week in which participants teed it up on six local courses, including the Old Course, toured the Royal and Ancient Golf Club, met representatives of the University’s international admissions department, had a special behind-the-scenes visit to the Ricoh Women’s British Open at Kingsbarns, and found time to go kayaking on the North Sea. As well as the Old Course, the group played on the Jubilee and New courses, the Duke’s, where they also had a special links golf clinic, the Torrance, and the hickory-only Kingarrock course at Hill of Tarvit. For context, they visited the British Golf Museum. Over 100 young people from Scotland, Kenya, South Africa and the USA have participated in New Links activities since it was founded in 2006 and the organisation has also funded a four-year scholarship at the University of St Andrews. 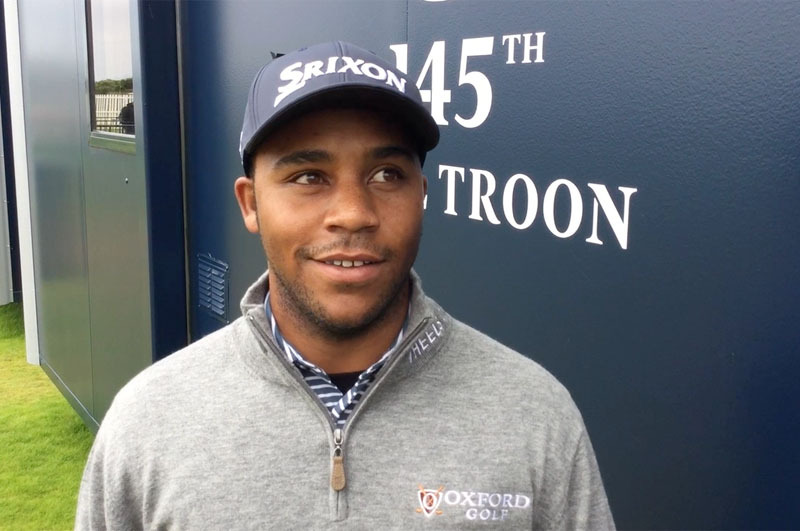 Harold Varner recalls visiting St Andrews on a New Links trip and celebrating his eighteenth birthday. 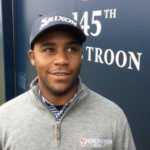 Harold Varner III takes time out from his first appearance at The Open to wish New Links well. Harold was a participant in the New Links youth visit of 2008, representing the Bill Dickey Scholarship Association. New Links, a St Andrews-based charity dedicated to helping young people achieve their potential through education, international travel and the game of golf, has celebrated its tenth anniversary by re-launching its international youth visit programme. Representatives of Youth on Course from California joined participants from the St Andrews golfing community in enjoying a week of activities that brought them into the heart of the town. As well as playing golf on the Old Course, the group played four other St Andrews Links courses; they had a special tour of the Royal and Ancient Golf Club, followed by a visit to the British Golf Museum, and a round at the unique hickory-only Kingarrock; they were also guests of Fairmont St Andrews and received a guided tour of the University. An afternoon of beach-based activities with Blown Away concluded this very special week. Kenny Wood, co-founder of New Links said: “I would like to thank everyone who helped us in making the event such a success. The Links Management Committee and the Royal and Ancient Golf Club both gave us tremendous support and encouragement, while Fairmont St Andrews and Kingarrock showed us real generosity. I’d also like to thank Nando’s restaurant for their hospitality to the group”. Over 100 young people from Scotland, Africa and the USA have participated in New Links activities to date and the organisation has also funded a four-year scholarship at the University of St Andrews.